Turkey is one of the Eurasian countries that straddle between the continents of Europe and Asia. Hence, Turkish people can get the best of both worlds as they get influences from Europe and Asia. Turkey used to the center of Ottoman Empire until nationalist leader Kemal Ataturk established the modern secular republic of which we know Turkey today. For more on this guide for travel to Turkey, you have more information for you below. Since President Ataturk died in 1938, Turkey experienced major struggle in terms of its market economy and democracy. Eventually, the political and economic stability was regained when IMF stepped in 2002 and offered a tough recovery program for Turkey. Turkey is best known for its diverse cultural heritage. It is also a member of several international organizations including United Nations, NATO, EEC and the Council of Europe, to name a few. Official Language: Turkish is the official language of Turkey. Wi­Fi Availability: Most hotels, cafes and restaurants have free Wi­Fi. The quality of connection for some is rather poor, though. Airport/s: The Istanbul Ataturk Airport is the main international airport for flights that travel to Turkey. Visa Required: You can learn more about the visa requirements when you travel to Turkey at their official website. Driving: In Turkey, you must drive on the right side of the road. International Driver’s License Accepted? You can use your driver’s license in Turkey for a period of 90 days. There is no need to present an international driver’s license unless your foreign ­issued license does not have a photograph. Crime: The last 20 years saw a dramatic increase in population in Turkey. This also resulted in a consequent rise in crimes in the country such as theft and homicide. The overall crime rate remains low, however, especially when compared to other countries of the same economic level. Electrical Adapters: In Turkey, they use the electrical outlet type of 230 volts at 50 Hertz. Meanwhile, the plug types used are C and F.
Trivia: Turkey is located above numerous plate boundaries. Hence, earthquakes are quite frequent in Turkey, especially in the north. The cuisine of Turkey features several similarities with the Ottoman cuisine. Meanwhile, it has several influences from Balkan, Mediterranean and Middle Eastern cuisines too. The Ottoman influences are most evident in the cuisine of Istanbul and other nearby cities. The western side of Turkey features an abundance of olive trees; hence, olive oil is used extensively in the dishes prepared in this part of the country. Kebaps – This is a popular dish in a lot of Middle Eastern and Mediterranean countries. The dish makes use of ground meat that is formed into shapes and placed into a skewer. 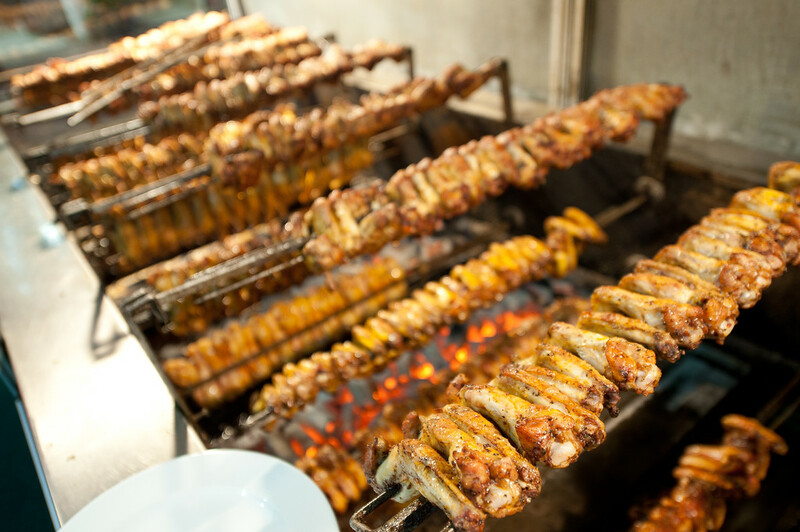 The skewered meat is seasoned with various spices before being cooked on top of a charcoal grill. Doner – This is also a grilled meat dish marinated with herbs and spices. It is then skewered on a spit and cooked vertically on a grill. Corba – This is a simple soup dish that Turkish folks love to eat during breakfast. It can either be made with tomato, lentil or black cabbage. Kumpir – This is a popular street food in Turkey, which is famous in seaside resorts or attractions. It is cooked using jacket potato cooked with a crispy outer shell but is soft and even mashed texture on the inside. Pide – This is a popular dish served at cheap and traditional restaurants in Turkey. It is made of a thin crust of pastry that is topped with egg, diced meat (chicken or tuna) and cheese. Then, it is cooked in a high heat oven. Kofte – This is Turkey’s version of meatballs. It is often served in a pita bread or wrap or sided with salad and rice for a gourmet style of dining. 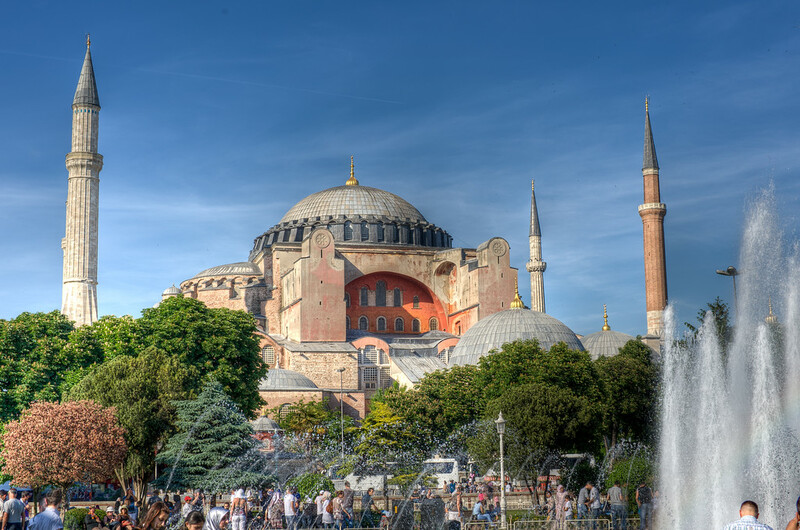 Hagia Sophia: This Christian patriarchal basilica is one of the most notable attractions for those who travel to Turkey (also a UNESCO World Heritage Site). 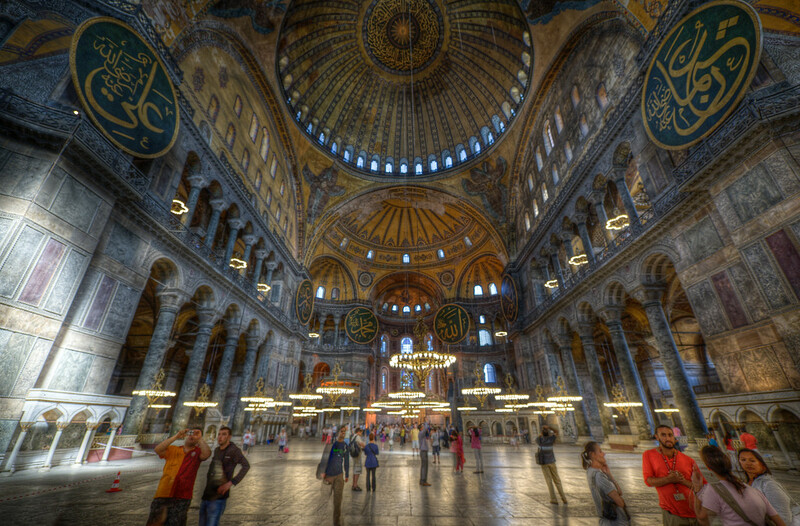 It features a Byzantine architectural style. Today, it is open to the public as a museum. 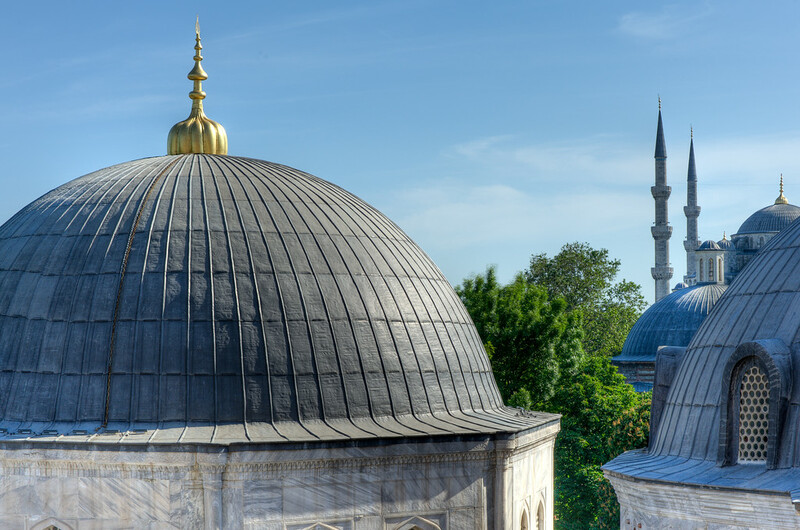 Sultan Ahmed Mosque: This Turkish mosque is a historic one in Istanbul. 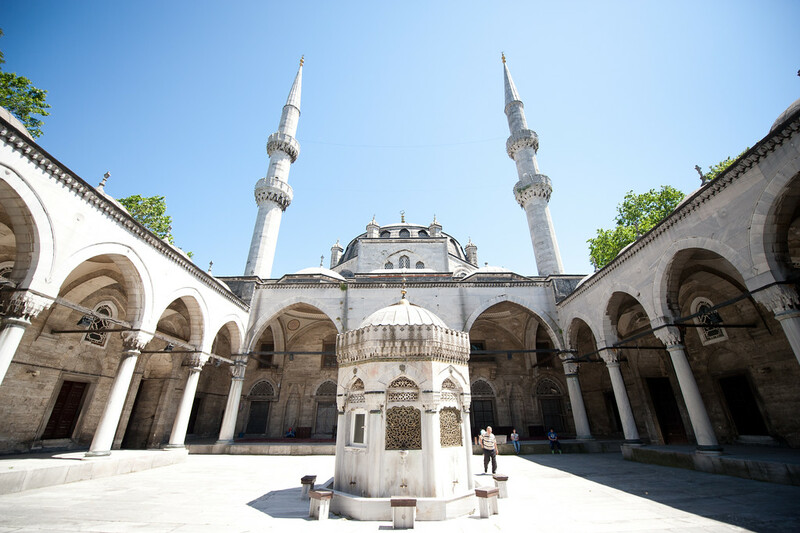 It is commonly referred to as the Blue Mosque due to the use of blue tiles on the interior walls of the mosque. The mosque was named after Ahmed I because the mosque was built during his rule. The architecture is a combination of Islamic and Ottoman architectural style. Galata Tower: This medieval stone tower is located in Galata Kulesi. It is 63 meters high and is made of rocks. Architect Koksal Anadol used Romanesque architecture for designing this tower. Basilica Cistern: There are over a hundred cisterns in Turkey and this is the largest of them. This is located in Istanbul. The Basilica Cistern is made up of 336 marble columns over 9,800 square meter area. Topkapi Palace: This palace is located in Istanbul served as the primary residence of the Ottoman sultans for over 400 years during their reign in Turkey. Today, it is a famous tourist destination with outlying gardens, pavilions, and a museum (the Hagia Irene Museum). Mount Nemrut: This mountain that measures up to over 2,134 meters high is famous for having large statues erected around it. These statues were believed to be tombs during the 1st century BC. The mountain is located at Adiyaman in southeastern Turkey.